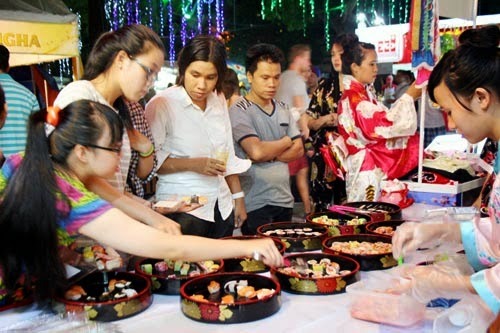 On 4th December 2014, the International Food Festival was launched at 23/9 Park in Ho Chi Minh City. The festival was held in 3 days (from 4th to 7th) which was a huge food event of the year. It gathered over 100 stalls of 60 restaurants and hotels representing for 21 countries across the world. The countries with amazing culinary include Brazil, Japan, Mexico, France, Germany, India, Algeria, Korea, etc. The participants introduced and presented their best foods and special features of their culinary as well as performed their traditional costumes and folk games. Especially, best dishes and specialties of Vietnam were introduced in the festival. You will have chance to enjoy almost all the traditional and featured foods of not only Ho Chi Minh City and the South, but the North, the Central and even Central Highland. International Food Festival attracted a great number of visitors during its 3 days of happening. How to get Vietnam Visa from Colombia? Can I use approval letter for entering Vietnam by land? Why Vietnam visa on arrival is preferred?